This post is sponsored by Fernet-Branca. All opinions and creations are my own. I recently had a cute taco lunch with my girlfriends to catch up and I made Fernet-Branca cocktails! Typically, you drink Fernet-Branca neat, but I decided to have some fun with it. A little background on Fernet before I get into the yummy recipe’s is that Fernet was born in Italy by the Branca family in 1845 and is still being managed by a sixth generation family member! Fernet-Branca is the preferred digestif on the market and made from 27 herbs, spices, & roots from 4 continents which makes a wonderful aromatic blend. As you know, I love my teas so drinking Fernet is delicious to me as I am all for herbs & spices in drinks. Take the first sip and pause a few seconds to introduce yourself to the decisive bitter tone of the Colombo, Aloe, and the unmistakable character of the Gentian. The second sip will reveal the distinct spiced avors of Zedoary (from the ginger family) and the full flavor of Chamomile. The overall richness of Fernet-Branca is not revealed until the third and final sip when the balanced bitter aftertaste prevails over the spicy tones of Myrrh. I decided to make two separate cocktails because even though I do love drinking Fernet neat after a big Italian meal, I knew my friends were going to be more into cocktails. Plus, it looks cute! Add grapefruit juice, Fernet-Branca, champagne and vodka. Shake until icy cold. Add strawberries and blackberries as garnishing inside drink. 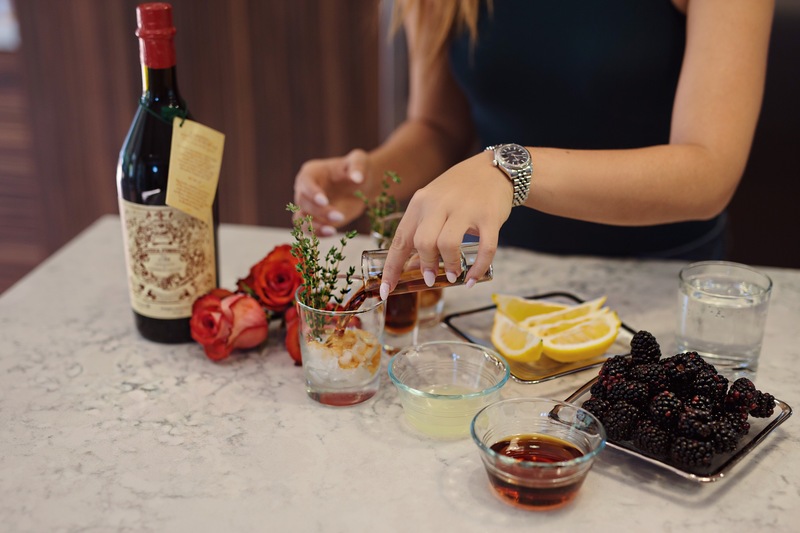 Combine Fernet Branca, lemon juice, maple syrup, blackberries, and thyme leaves. Toss in a handful of ice and mix. Mix until the blackberries are being loosened up into the drink. Add club soda and serve on the rocks glass or as a martini. My favorite for sure was the Fernet-Branca with Thyme and Carpano. My friend Camila liked more the Fernet-Branca with Berries and Rosé. 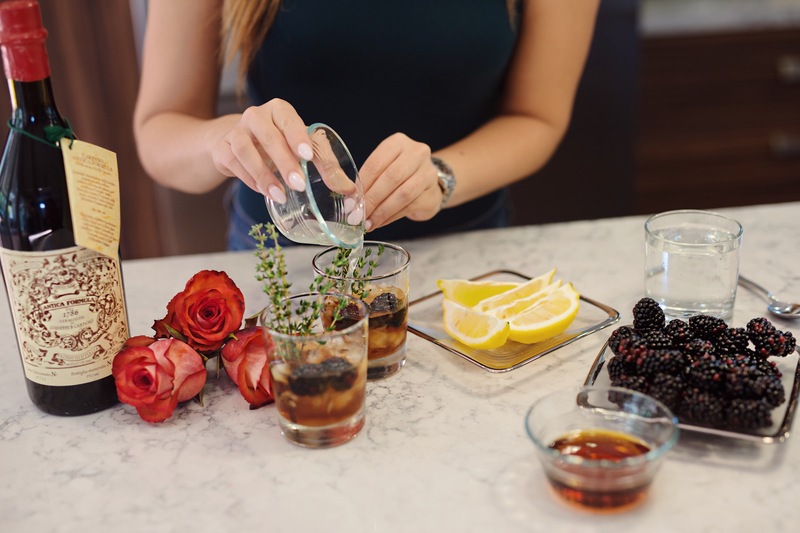 The spices and herbs in the Fernet makes it a relaxing yet delicious drink! If you try making these at home, let me know!